The 2001 Legacy Plan promotes higher overall densities and infill projects in GMAs 1, 2 and 3 while steering significant development away from the Rural and Future Growth Areas. Through Area Plan recommendations and action on zoning cases, higher-density housing has been encouraged at Activity Centers, downtown and along Urban Boulevards. Significant higher-density growth has occurred along Peters Creek Parkway, Griffith Road, University Parkway and other corridors designated in Area Plans. The recent adoption of a residential infill ordinance for GMA 2 should further help implement this Legacy goal by increasing densities where infrastructure is available. Protection of the rural areas of the community has been helped by the creation of a agricultural tourism district giving landowners viable options for retaining their farms. An analysis done for the rural western section Forsyth County shows that extending sewer beyond the Muddy Creek ridgeline is cost prohibitive at this time, backing the Legacy goal of not developing land prematurely. Increased overall residential density was a primary goal discussed in the 2001 Legacy Plan. However, as noted in Chapter 2 of the Legacy Update, the overall population density in Winston-Salem has actually decreased from 2.9 persons per developed acre in 2000, to 2.7 persons per acre in 2010. 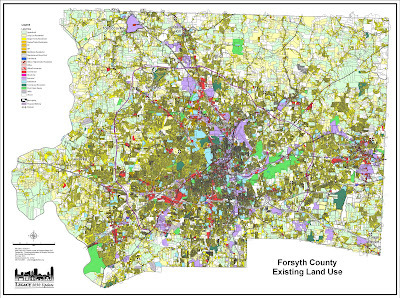 The Existing Land Use Map for Forsyth County (above) reflects the prevailing low-density development. While progress has been made, there still is not enough land used for higher-density residential in strategic locations. If our community desires to increase its residential development densities to encourage more compact growth and transit opportunities, we clearly will need additional tools and strategies to make it happen.